I specialize in sales of beachfront homes and lots at Mandalay Beach-Oxnard Shores, Hollywood Beach, and Silverstrand Beach, Oxnard CA 93035. I keep current of all transactions in these areas. In Ventura County since the year 2000 I have represented seller and/or buyer in 70 successful beachfront transactions (...as per VCCAR MLS). I know the oceanfront beachfront. I've been working the same area for over 20 years; existing homes, new construction, lots; if you need accurate beachfront oceanfront information, contact me anytime. Sunday, April 4, 2004, "The Ventura County Star"
Gary Cuoco, a sales associate with the Oxnard Beach office of Coldwell Banker Residential Brokerage, has earned membership in the company's International Presidents's Premier. Only 1 percent of the more than 113,800 Coldwell Banker Real Estate Corporation sales associates worldwide qualify for the distinguished award. As a member of the company's International President's Premier, Cuoco will be invited to attend the company's Elite Retreat, a three-day conference conducted exclusively for the company's top sales associates being held this month in Palm Desert. Cuoco was presented with the honor at the company's International Business Conference, held in Las Vegas. The annual event brought more than 10,000 Coldwell Banker Sales Associates, Brokers, Managers, and employees together for an intensive program of professional development and recognition of achievement. Barbara Walters, ABC News correspondent, co-anchor of "20/20," and co-host of ABC daytime's "The View," was the keynote speaker for the high-powered gathering. Conference entertainment included: master of ceremonies game show host and successful businessman Bob Eubanks; comic genius Richie Minervini; the popular dance band, The Zippers; and the Grammy Award-winning female trio, the legendary Pointer Sisters. 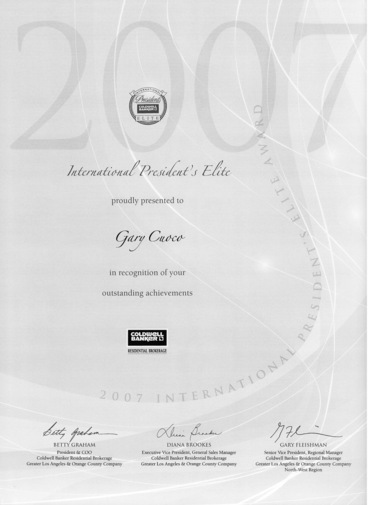 "Gary Cuoco is a worthy recipient of the award as a member of the International President's Premier," said Alex Perriello, president and CEO, Coldwell Banker Real Estate Corporation. "His efforts exemplify great expertise in the real estate industry and dedication to helping customers. At a time when homeownership is increasing, the service that Cuoco and so many of our other sales associates provide is a significant reason why Coldwell Banker is the first choice for homebuyers." Perriello said the real estate industry experienced the best year on record in 2003, fueled by historically low mortgage rates and a strong demand of first-time homebuyers. "With the economy improving, consumer confidence rising, jobs being created and continued attractive mortgage rates, we expect to see a favorable housing market in 2004." "Gary Cuoco has earned many awards for his business in the last several years, including Top Sales Person of the Month and Top Sales Person of the Quarter," said Harriet Clune, branch manager of the Oxnard Beach Office. "He was recognized in 2003 as the Top Producer for the Oxnard offices of Coldwell Banker. We are very pleased to recognize Gary's accomplishments."